The effects on the abdominal area are similar to Dhanurasana but are slightly increased as the stretch and pull is not transferred to the hands and legs but is carried by the abdominal area. The body weight is balanced on the abdominal muscles and they are given pressure so that the intra-abdominal organs, i.e. stomach, liver, spleen, pancreas and intestines are massaged by the change in pressure. It also improves the secretions of these organs. It improves the peristalsis of the intestine and relieves constipation. The blood flow to the abdominal organs is also improved. Sluggishness of the liver is removed as is dyspepsia. With regular practice it will reduce the fat around the abdomen and thigh areas. There is a complete stretch from the fingertips to the toes, releasing tension in the whole body. In prone position, stretch the arms in front of the head, resting them on the floor with the palms joined together, rest your forehead on the floor. Exhale and while inhaling raise the arms, forehead and chest from the ground and at the same time raise the legs from the waist, keeping the legs together and knees straight. Maintain the asana, breathe normally. Inhale and while exhaling slowly lower the shoulders, forehead, arms and legs onto the floor. Return both hands to the sides of the body and place the chin on the ground, returning to Prone position. Relax the body and breathe deeply. Keep both the legs straight in the knees and toes pointed. Keep both the arms straight in elbows and palms joined in Namaskar position over the head. Keep the head between the arms throughout the asana, arms against the ears. Try to balance on the abdomen. Try to raise the thighs off the ground. Try to raise the shoulders and chest off the ground. Bend the elbows or knees. Keep distance between legs or knees. Should be completely avoided if you are suffering from diseases of the backbone. If there is recent abdominal surgery, hernia or ulcer in the stomach this posture should be avoided. Must be avoided if suffering T.B. Pregnancy and menstruation. There will be some rocking movement because of diaphragm movements for breathing. 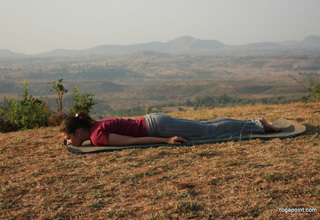 Saralhasta Bhujangasana. 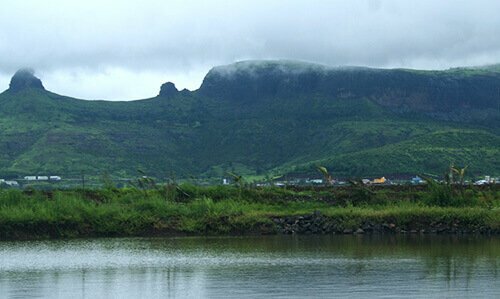 Vakrahasta Bhujangasana. Shalabhasana. Dhanurasana.